How to implement a pixelated screen transition shader? I am interested in creating a screen transition seen in a lot of retro games. The transition is just a kind of pixelated distortion that increases or decreases in granularity over time. 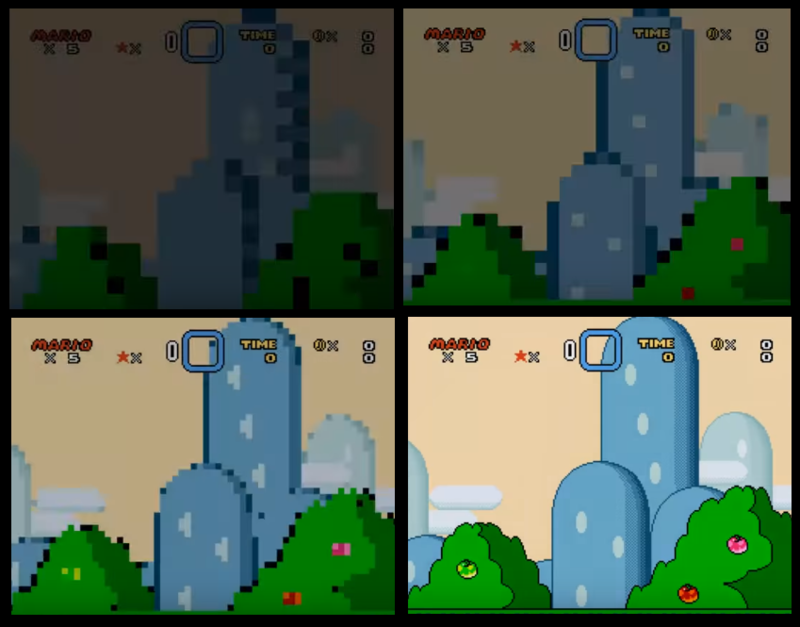 The effect is present in Super Mario World, and can be seen recreated in this clip. I want to achieve this by animating the uniforms of a GLSL shader. Unfortunately, I don't know how to design the shader. I know how to sample gradient textures to create various screen wipes, as well as how to sample noise textures to create simple distortion effects. But I can't figure out exactly how to create this effect. Any advice on how to set up a shader to achieve this effect? You need to make psuedo pixels. The great thing about this effect for this purpose is that it didn't do an average of the pixels, but chose the colir at the top left corner, so you won't have to do a costly averageing shader. You'll need to pass in the screen size to the shaders (screenSize) and the size of the pixels you want (pixelSize) and you'll have to have uv/texture coordinates. Not the answer you're looking for? Browse other questions tagged opengl 2d shaders glsl or ask your own question. How to create a “retro” pixel shader for transformed 2D sprites that maintains pixel fidelity? How can I implement 2D cel shading in XNA? How to implement multicolored flashing sprite effect like in Contra and the Messenger?